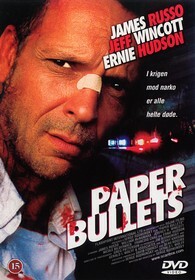 Paper Bullets is another action film by Serge Rodnunsky. He's definitely hit or miss. One of his other films, Jack Of Hearts, is terrible. John Rourke (Russo) is A Cop On The Edge who's son is kidnapped. Nothing stands is his way to find him, not his captain (Hudson), fellow cops (including Wincott), Nobody. The action scenes are well-filmed and the actors do their best with the cliched roles they've been handed. Russo and Hudson are always entertaining. If you're looking to fill a B-movie addiction, this is a good fix. I love Ernie Hudson, so I may still check this out. Going back to an old review here, how much Wincott do we get in this film? I can get it pretty cheap and it looks good. Film Fiend: Yeah it's not too bad. Fun B-movie action. Explosive Action: From what i remember, There's very little Wincott action, more talking from him...but it's still not a bad movie...if you like James Russo.